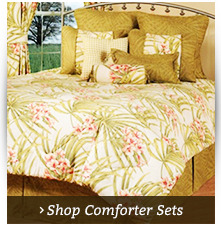 The La Selva Natural Comforter Set is a lovely bedroom set that brings a touch of the tropics to your boudoir. 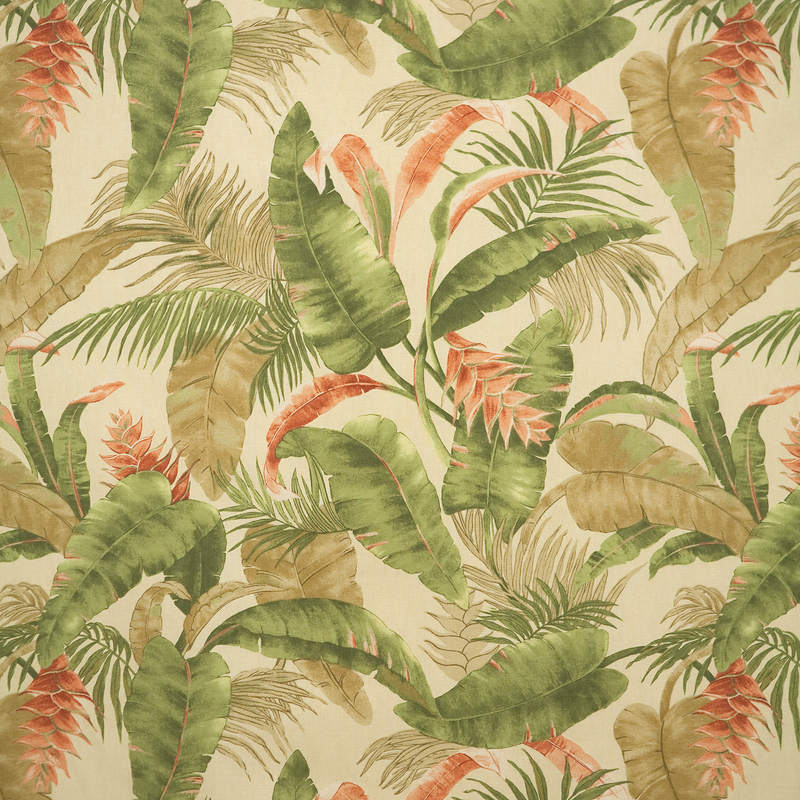 The La Selva print is a lush rainforest print with palm leaves and bird of paradise blooms in a muted tone over a beige background. Each set comes with a beige bed skirt and coordinating pillow shams. 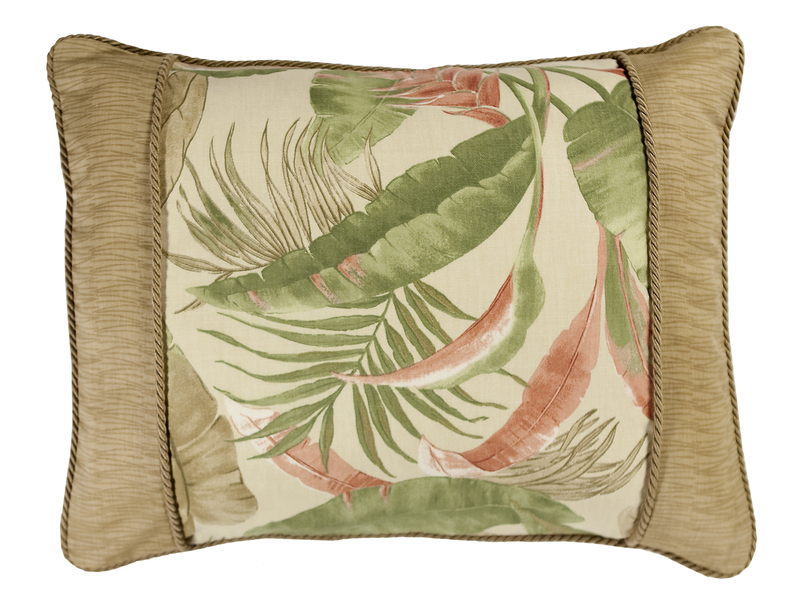 The La Selva line includes curtains and throw pillows in the tropical print plus contrasting fabrics to complete your look. The comforter set is made in the U.S. from cotton fabrics. * Twin 3-piece Set includes comforter measuring 66-inches by 90-inches, one standard pillow sham and one bed skirt with a 15-inch drop. * Full 4-piece Comforter set includes comforter measuring 82-inches by 90-inches, two standard size pillow shams and one bed skirt with a 15-inch drop. * Queen 4-piece set includes comforter measuring 92-inches by 96-inches, two standard size pillow shams and one bed skirt with your choice of 15-inch or 18-inch drop. * King 4-Piece set includes one comforter measuring 110-inches by 96-inches, two king size pillow shams and one bed skirt (platform measures 78-inches by 80-inches) with your choice of 15-inch or 18-inch drop. * California King 4-piece set includes comforter measuring 110-inches by 96-inches, two king pillow shams and one bed skirt (platform measures 72-inches by 85-inches) with your choice of 15-inch or 18-inch drop. 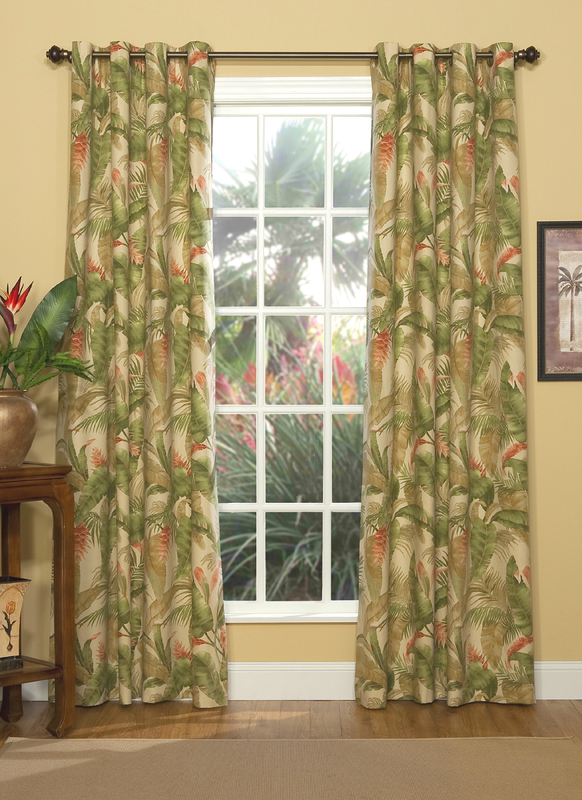 The La Selva Natural line from Thomasville is centered around a muted tropical print of palm leaves, bird of paradise blooms and leaves over a beige background. The comforter in this line uses the cotton floral print throughout. The bedskirt ruffles in a neutral tan, barely darker than the background of the floral print. Thomasville offers the line in comforter sets, and also as separates. Purchase the La Selva comforter, or the coordinating bed skirt, separately. You can use the two pieces together, or pair them with other pieces in your bedroom. This option allows you to mix and match sizes, patterns and other elements. 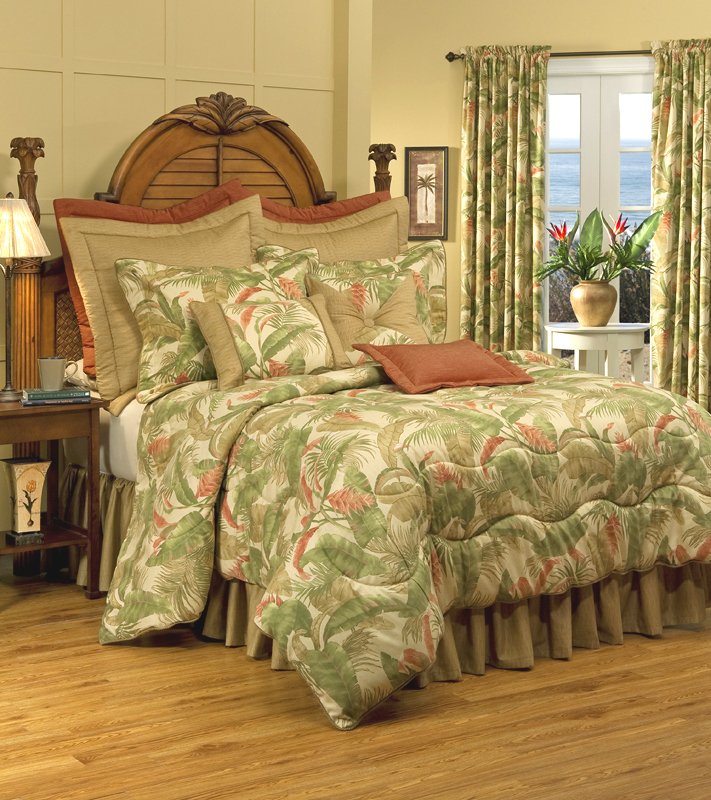 The La Selva Natural pattern bedding and curtain sets from Thomasville offer a mood of the tropics. 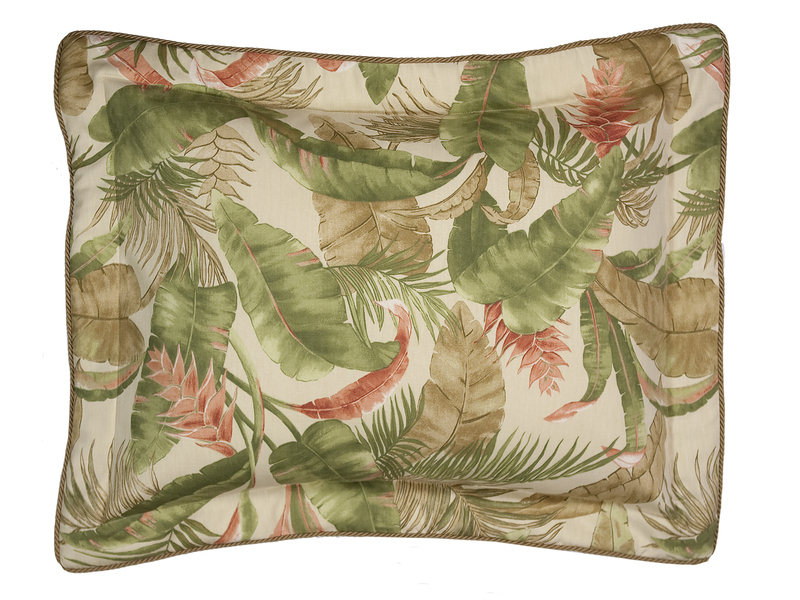 The cotton fabric is printed with palm leaves and bird of paradise blooms and leaves in muted colors over a beige background. The standard size pillow sham measures 20-inches by 26-inches, and has a 2 1/2-inch flanged edge with a gold braided rope around the border. King size sham measures 20-inches by 36-inches plus the 2 1/2-inch flanged edge. 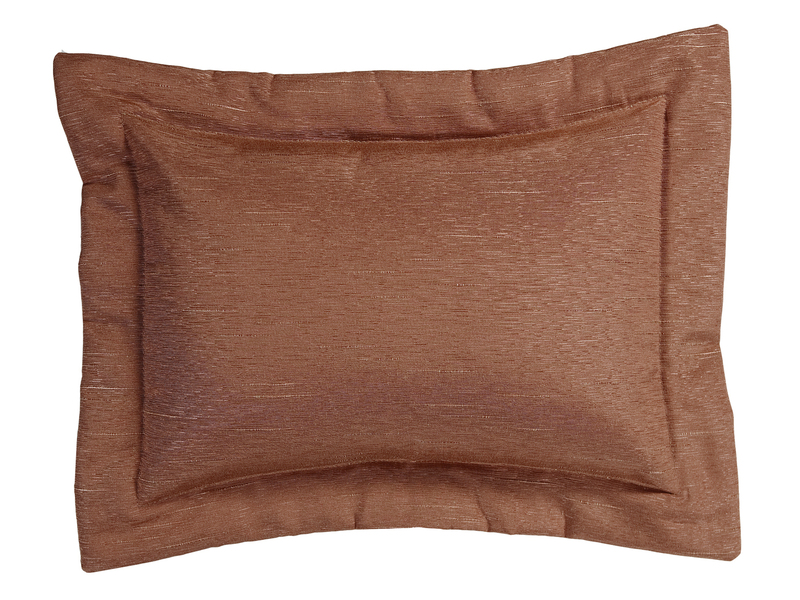 The pillow is interlined for extra body, and has an envelope enclosure on the back side to secure the pillow comfortably. 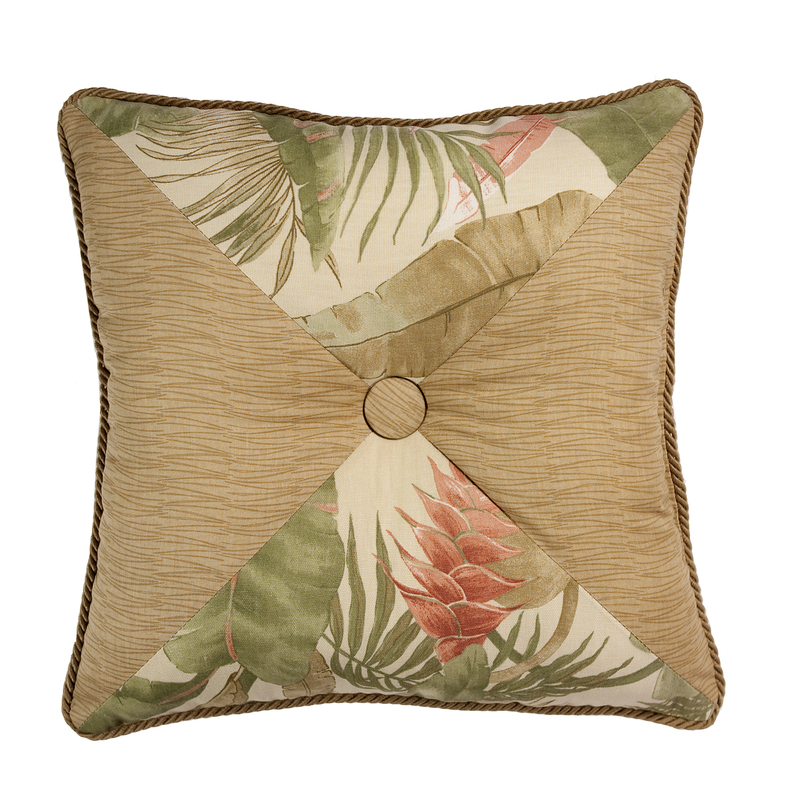 The La Selva Natural pillow sham can be used with the La Selva comforter set, and coordinating separates. It can also be used with other pieces, including greens, golds and salmon reds pulled from the print. If you like to steam up your bathroom with long, hot showers, the La Selva Natural shower curtain from Thomasville is right at home. The shower curtain features a tropical print with palm leaves and bird of paradise blooms and leaves in muted colors over a beige background. The shower curtain measures 72-inches by 75-inches, and is printed in the U.S. from 54-inch wide cotton duck fabric. The shower curtain is unlined, and secures along the top for hanging with button holes. The tropical print will bloom for years in your steamy bathroom. La Selva Natural, with its a tropical allure, features green, orange, and gold tones on a light natural ground. The pair measures 100" wide (two 50" wide panels) by 84 inches long, is fully lined, and has eight Antique Brass grommet per panel with a 1 1/2 inch inside diameter. Allow one and one half times your rod width for proper fullness. 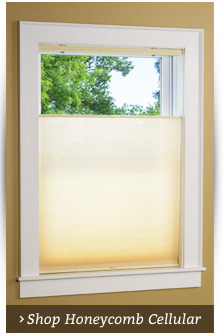 Add multiple pairs to accommodate wider windows. Use a 1 3/8" diameter or less decorative rod for hanging. Fabric is Cotton Duck and is made in the USA. 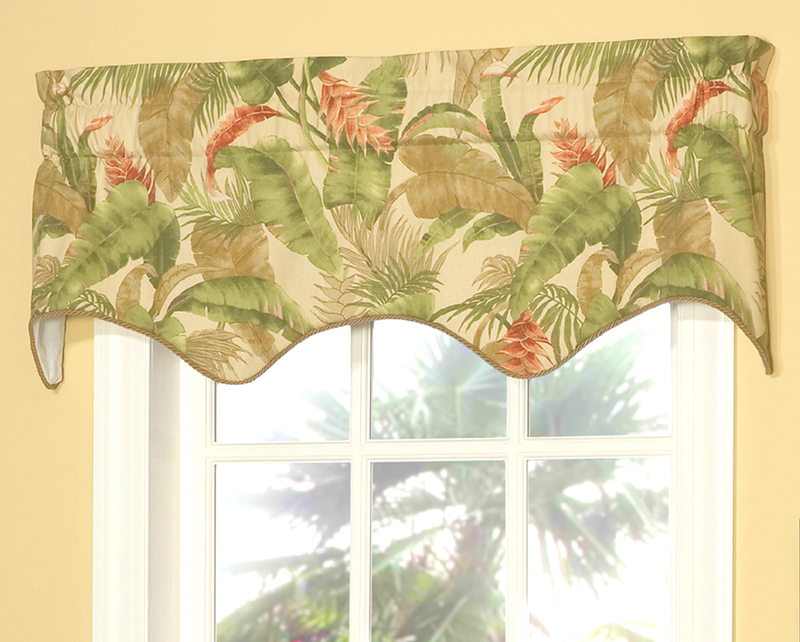 The La Selva Swag is a tropical design available from The Curtain Shop with shades of green, orange and gold against a light natural background. The 2 piece Swag measures 100 inches wide and 30 inches long. It has a scalloped bottom edge adorned with Twisted braid cording and is fully lined, with a 3 inch rod pocket and two inch header. Allow two times your rod width for proper fullness. Use a 2 1/2 inch continental rod for hanging. 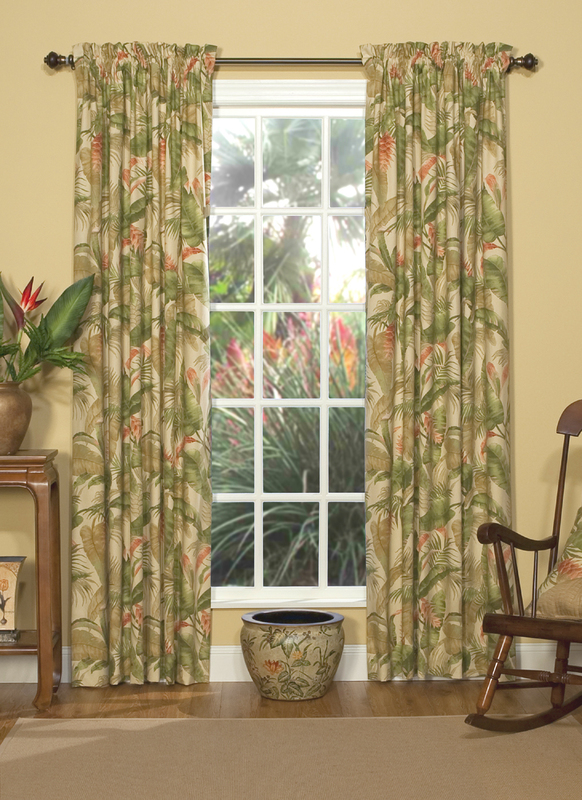 The La Selva Filler Valance is a tropical design available from The Curtain Shop with shades of green, orange and gold against a light natural ground. These 100 percent cotton fully lined window valances are 50 inches wide and 16 inches long to use alone or with matching Empress 2 piece Valance. 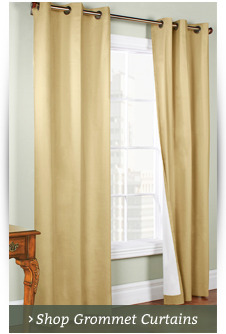 Use a 2 1/2-inch continental rod with the 3-inch curtain rod pocket for hanging. The scalloped, corded border adds a beautiful finish. 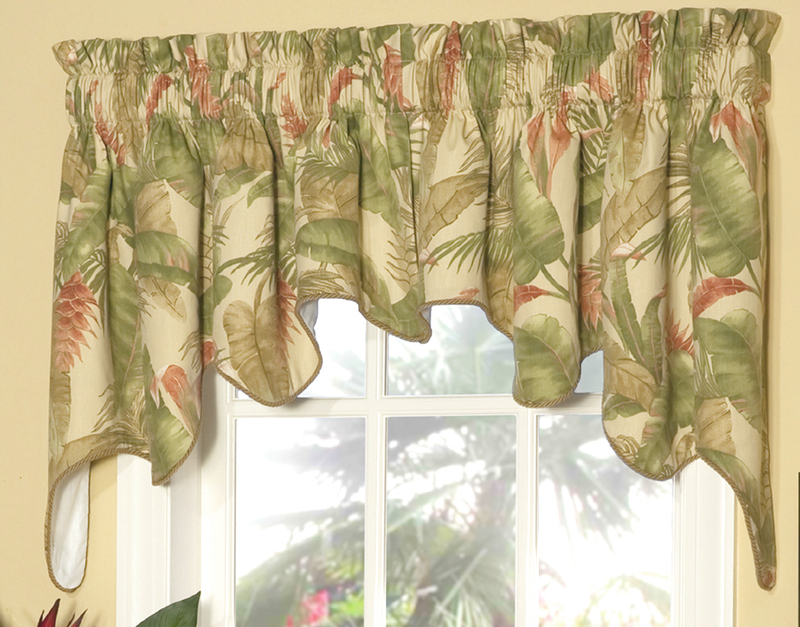 For more fullness, simply order one more valance for a lusher look. MADE IN THE U.S. The Valance measures 50 inches wide and 16 inches long (for a gathered look use multiples with a 2 to 1 ratio of fullness). It's made of cotton duck fabric in the USA, is fully lined, has a 3 inch rod pocket, and 2 inch header. The coordinating band along the bottom edge matches the La Selva Natural by Thomasville Comforter Set ensemble and decorative pillows. It's made to gather on the curtain rod. Allow at least two times the width of your rod for proper fullness. Use either a decorative rod or a 2-1/2 inch continental for hanging. Multiples work well together to accommodate wider windows. 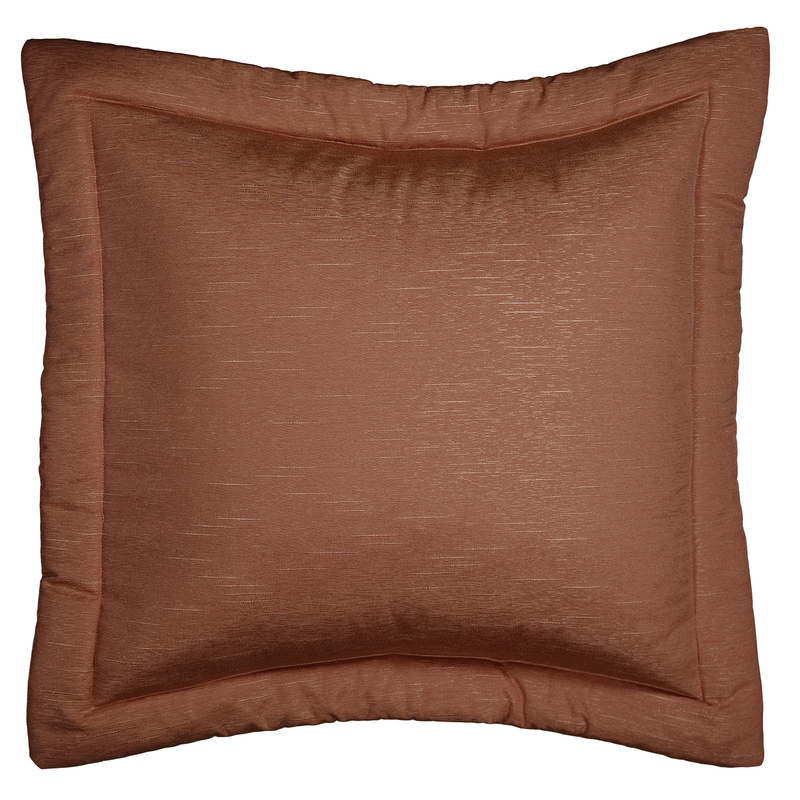 Pillow face is a 3 piece fabric construction with twisted braid cording on all sides. Made of 100% Cotton in the U.S.
Breakfast Pillow measures 16" x 20", has flange edges and an envelope closure on the back side. The fabric is a woven textured fabric. 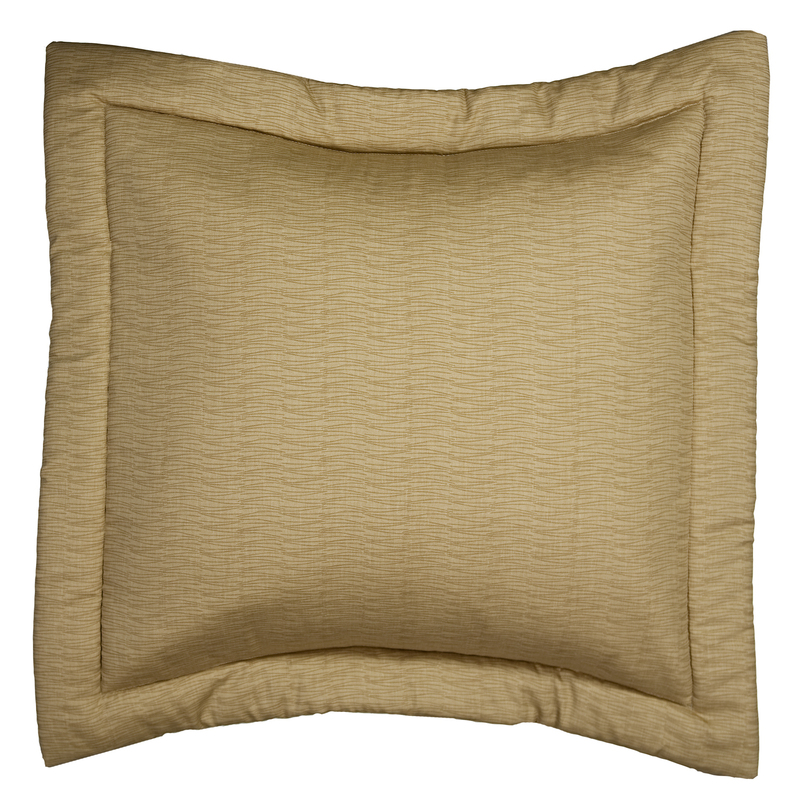 Made in the U.S.
Four piece construction on pillow face with covered button detail. Made of cotton in the U.S.
Dimensions are 26" x 26" not including the 2.5" flange edge. Fabric content is a poly/cotton blend. Dimensions are 26" x 26" not including the 2.5" flange edge. 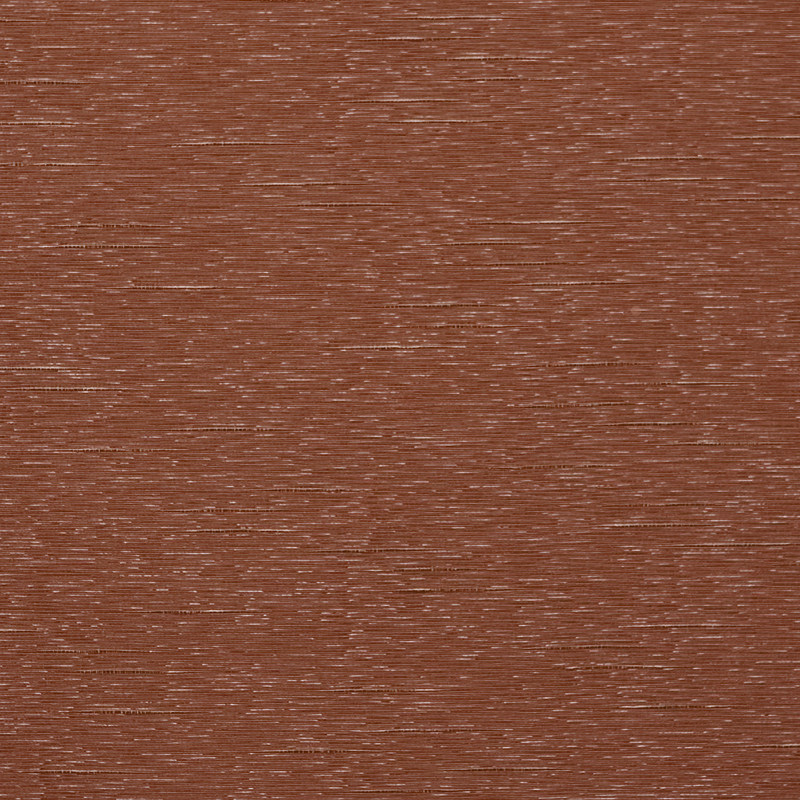 Paprika fabric is a woven textured fabric. Fabric is 54" wide and sold by the yard. Fabric is cotton duck. Fabric is 54" wide and sold by the yard. 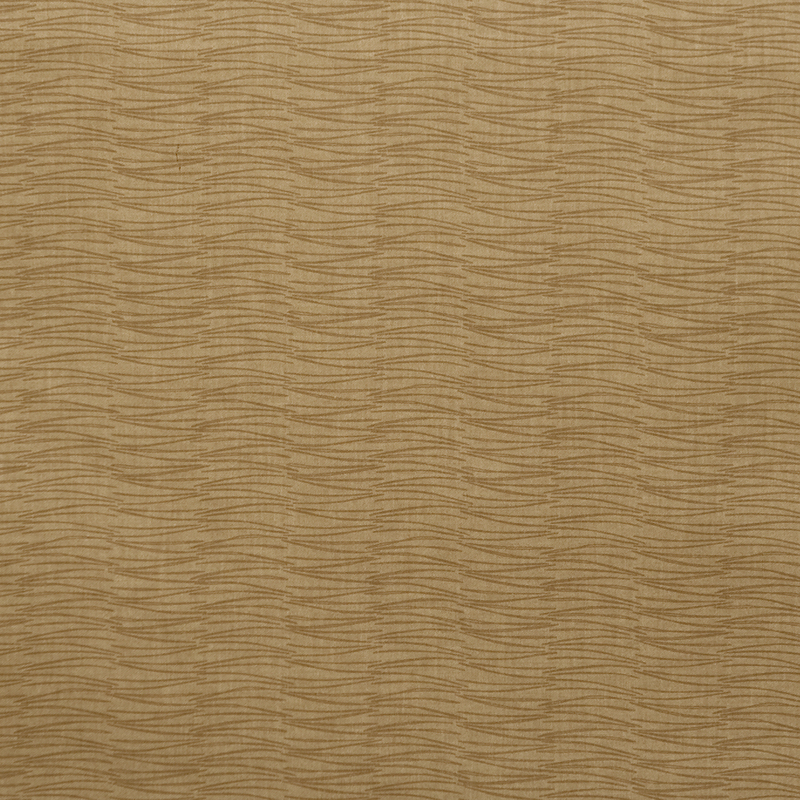 Fabric is a textured coordinate. to La Selva Vanilla main print. Fabric is 54" wide and sold by the yard. Fabric is cotton and polyester blend. Take a permanent trip to the jungle by sprucing up your bedroom with the La Selva Natural Comforter Set by Thomasville from The Curtain Shop. A tropical fauna print full of green, gold and paprika colors covers a parchment-colored background to create a beautifully wild fabric. Coordinating fabrics in solid grass and solid paprika have been expertly matched to enhance the beauty of the set as a whole. 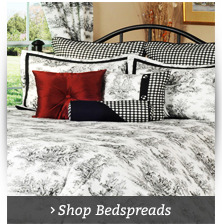 Each bedspread set includes one comforter, one bed skirt and one or two pillow shams, depending on bed size. You can also purchase each of these items separately, if you prefer. Order your Thomasville Comforter Set from The Curtain Shop today in sizes including Twin, Full, Queen, King and California King. 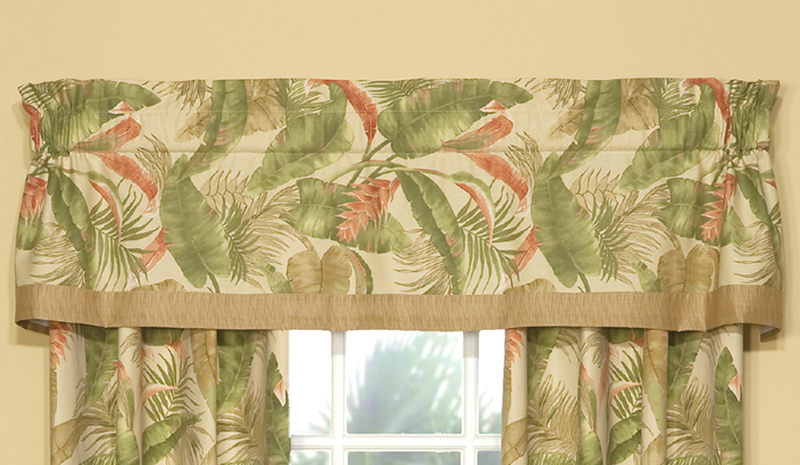 Add to your tropical bed linen collection by including matching window treatments in your order. Choose from a variety of different curtain and valance styles to suit any taste. Throw pillows are also available in breakfast and square styles. You can also purchase a matching shower curtain. If you would like to craft your own textile creation, all Thomasville La Selva Natural fabric is available for purchase by the yard.